Loki must choose between saving Thor or giving the Space Stone to Thanos. Starlord must choose whether or not to kill Gamora to prevent Thanos from learning the location of the Soul Stone. Gamora must choose between Nebula being tortured or leading Thanos to the Soul Stone. Thanos must choose whether or not to kill Gamora to acquire the Soul Stone. Scarlet Witch must choose whether or not to kill Vision in order to destroy the Mind Stone, which Captain America calls “trading lives”, to keep it from Thanos. In addition to the personal examples, the underlying conflict ensues due to Thanos’s decision to “trade lives”: in order to save the galaxy from perceived overpopulation, he purposes to use the infinity stones to randomly kill half the population of all sentient species. While this seems absurdly evil, many well-meaning people believe we must “trade lives” for a perceived greater good, which they express in their politics. For instance, anyone who justifies a war willingly trades lives: their nation’s soldiers, enemy combatants, and innocent civilians. Any pro-choice individual who also believes the unborn are human persons trades the life of the unborn for perceived benefits to the mother. Any person who would close the door to refugees trades lives of men, women, and children for presumed safety. While Infinity War identifies pros and cons of sacrificing lives for a greater good, it gives five insights we must consider, especially as it relates to political beliefs. While most characters sacrifice to stop the villain, Thanos kills his daughter Gamora to acquire the Soul Stone, needed for reducing the galaxy’s population. Since overpopulation had devastated his home world of Titan, he believes the galaxy would suffer the same fate. Not only is his conclusion immoral, the reasoning doesn’t follow as the galaxy is much larger than Titan. We must work towards our vision of the greater good, but unlike Thanos, we must remain humble, knowing our picture of utopia might not be completely accurate. Consequently, we must be rather careful who or what we sacrifice for a likely flawed understanding of the greater good. Even if we properly envision the greater good, we must acknowledge we don’t truly know which actions will lead to our desired end. Multiple people either kill (like Scarlet Witch) or try to (like Starlord), but it did not stop Thanos. Sacrificing lives does not guarantee success. In contrast, only Doctor Strange knows the future, and he chooses not sacrifice. Unless you’re omniscient, don’t rush to trade lives. 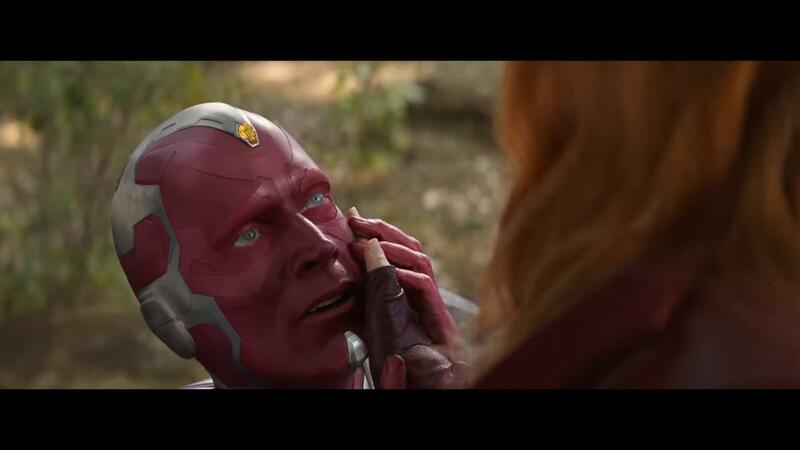 Vision explains that the Avengers must choose to destroy the Mind Stone, which would kill him, or Thanos will have it. Similarly, when people try to justify war or other violent action, they make a similar error: fight (which sacrifices countless lives) or passively surrender. Instead, the Avengers seek a third option: to surgically remove the Mind Stone from Vision in Wakanda. They don’t know if it will work, but they proceed with hope. Is that risky? As stated in the previous point, unless you see the future, you never know if your actions will succeed. If violence does not guarantee success, why not seek peaceful resolution to conflicts? I recently discussed Abraham’s attempt to sacrifice his son Isaac in depth. To briefly recap the Biblical story, God commands Abraham to sacrifice his son, but intervenes at the last moment to save his life. The story teaches we must sacrifice, i.e. surrender what we hold most dear to the greater good, but we must never sacrifice, i.e. kill an innocent person. While characters from Infinity War focused on the latter understanding, they would have saved the galaxy had Starlord accomplished the former. The heroes had almost removed the infinity gauntlet when Starlord learns Thanos had killed Gamora. Clinging to his desire for her and consequently his desire for revenge, he attacks Thanos in anger, foiling the attempt to remove the glove. We see that the nobility of sacrifice lies in self-denial (and it’s difficult). Politically speaking, this could involve giving up your claim to something you and others in your voting bloc value. Based on the above points, it seems the film argues in line with the Abraham and Isaac story that one must never sacrifice, i.e. kill, an innocent life. Is such idealism realistic? Shouldn’t one life be traded to save half of all sentient beings in the galaxy? Our moral intuition argues it is noble for Vision to offer his life, while it is morally reprehensible when Thanos sacrifices his unwilling daughter. One can freely sacrifice themselves, but not another and certainly not an unwilling victim. As mentioned in the link, the Abraham story also contains this exception as it foreshadows Christ’s sacrifice. After all, the essence of Jesus’s message is that He willingly sacrificed Himself for all. I hope you are not frequently given the choice to kill in order to save the galaxy. Nevertheless, political choices often have life or death consequences. How could you apply these five principles to your political philosophy and voting habits? I thought that all the lives lost in the battle at Wakanda were traded so Vision; an android, can have a chance to live. Why not download Vision’s consciousness then destroy the stone before tons of people die in the battle. The Avengers were very selfish in this regard. Very good point. Captain America correctly says that killing Vision would be trading lives. But so is putting people in harm’s way in which death is inevitable. Hence, war is always trading lives, both the lives of the enemy whom you try to kill as well as your own people whom you risk. Regarding the idea to download Vision’s consciousness, you give a good example of point 3 from above, “Reject the Incomplete Choice” and find a non-violent option.